Transgender woman Breanna Sinclairé made history Wednesday night by becoming the first transgender person to sing the National Anthem at a professional sporting event. 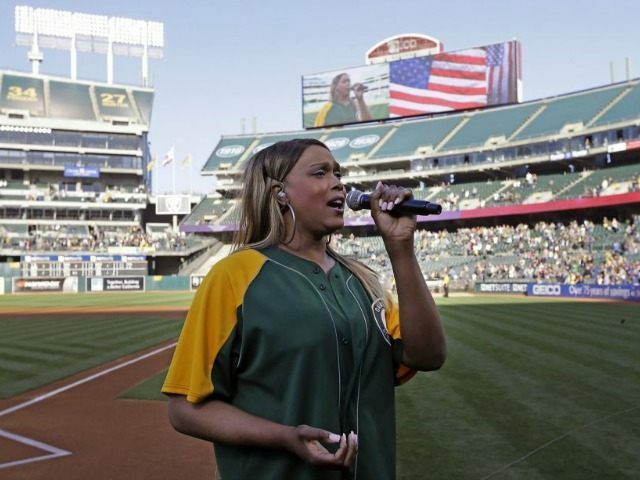 Sinclairé, a classically-trained opera singer, took to the mound at Oakland’s O.co Coliseum to belt out the Star-Spangled Banner before the A’s faced off against the San Diego Padres in the first game of a two game series. Sinclairé’s performance came on Athletics Pride Night at the Coliseum. The A’s honored Glenn Burke, baseball’s first openly gay player, who played for the team between 1978-1979. Burke died of complications from AIDS in 1995. Billy Bean, Major League Baseball’s Ambassador for Inclusion and an openly gay former player himself, reportedly greeted members of Burke’s family before the game. Burke’s brother Sidney threw out the first pitch.